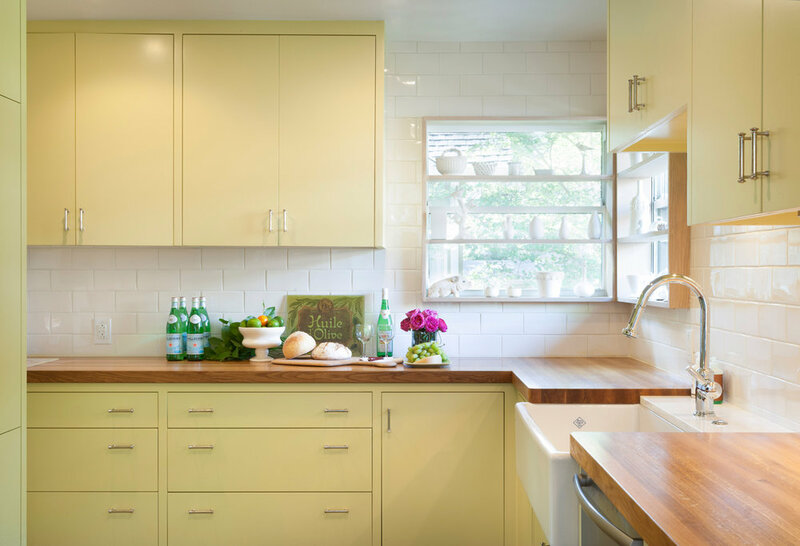 The kitchen renovation was the heart of this Tarrytown flat renovation, although the project scope included both bathrooms, all new furnishings, finishes and hardware throughout. The building itself is a 1950 brick two-family unit, surrounded by incredible gardens on a quiet, tree-lined street. The new owner wanted to transform the mostly original structure into a more imaginative, Parisian-inspired place that could adequately display her collected wares as well as provide several spots for her own creative projects. In the kitchen, we adjusted the layout from a dead-end U-shape galley and opened up to the adjacent living area. This brings in so much light, but also gives some relief to the long, narrow room. The white oak butcher block counters are spared from faucet drips with the customized design of the marble sink deck. Shelving built into the trim box at the corner window provide a great spot for petite pottery. The cabinet color was modeled after a tea shop in Paris and is reminiscent of a Bartlett pear. The new breakfast nook has a sunny view facing the back deck, and serves as the main entry to the flat from the carport. The custom X-mullion doors recall historic millwork details and bring some pattern into the kitchen. The niche was completed with a large map of Paris framed by raw steel and brass screws. 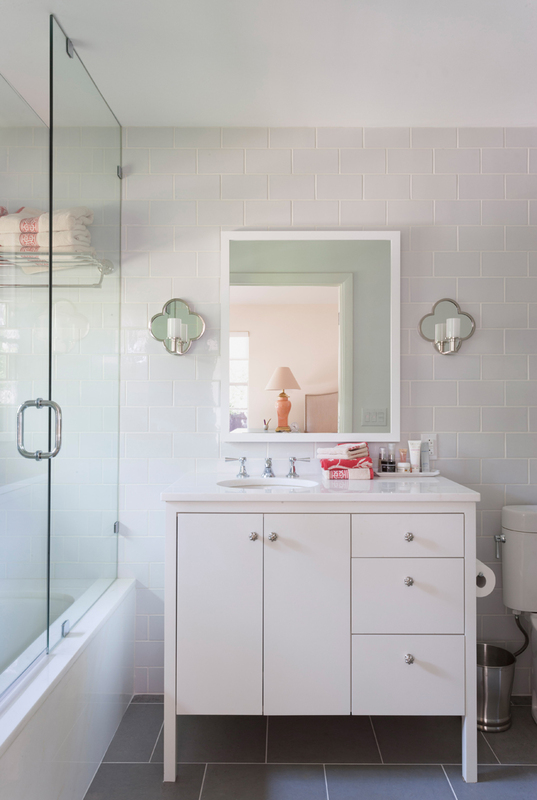 Both bathrooms were completely overhauled for updated fixtures and a more elegant finish. 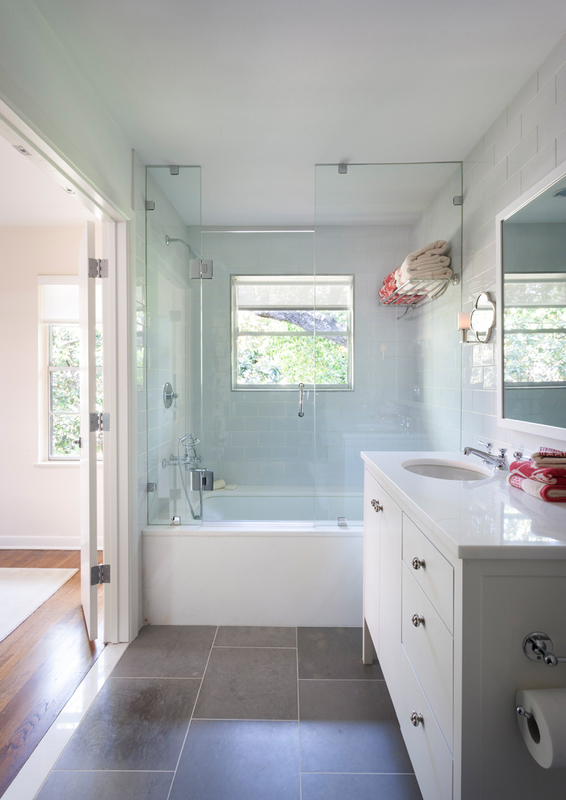 This master bath has a glass enclosed tub, with a Waterworks ‘telephone-style’ handheld shower and Thassos marble surround. The custom vanity on the left sits on legs, appearing more like furniture. Waterworks Quadrifoil Lawson sconces complete the feminine look.